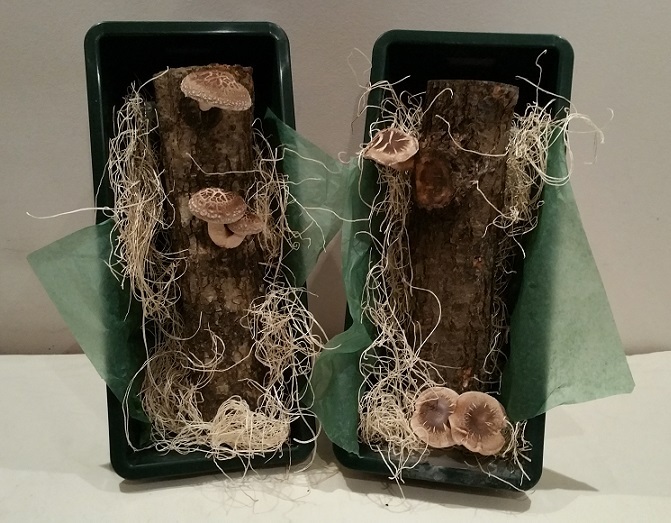 Lost Creek Mushroom log kits are ready-to-grow hardwood logs from 6 to 14 inches long, priced from $18-$90 -- fun, easy, natural and guaranteed to grow. For the vegetarians, mushroom lovers and gardeners on Santa’s Gift List, a Shiitake Mushroom Gift Log Kit from Lost Creek Mushroom Farm is a unique, fun, and flavorful treat that keeps on giving for years. Shiitakes growing on an inoculated log. Fascinate and feed friends and family with gift log kits, from 6 to14 inches long and lasting 3-5 years. Kits over 9" are fully guaranteed. 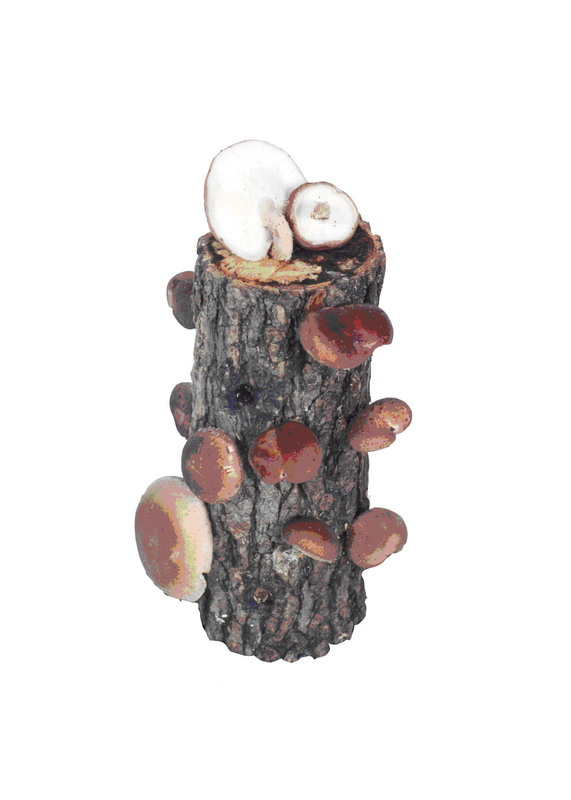 Lost Creek Mushroom Farm shiitake log kits are fun, easy, natural, and guaranteed to grow. From $18-$90, there's a gift for every budget. For the vegetarians, mushroom lovers and gardeners on Santa’s Gift List, a Shiitake Mushroom Log Kit from Lost Creek Mushroom Farm is a unique, fun, and flavorful gourmet treat that pops out organic shiitakes about every two months for 3-4 years or more. The shiitake mushroom is the second-most popular mushroom in the world and a favorite gourmet mushroom. 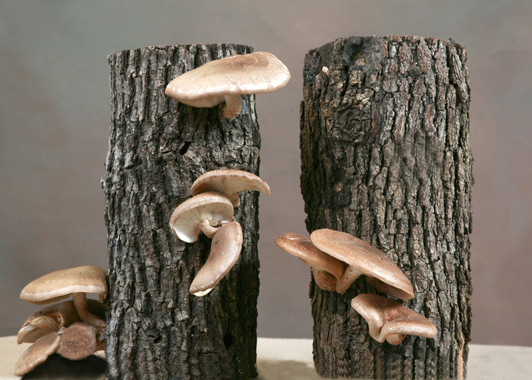 Shiitakes grow wild on hardwood logs in Asian forests. Lost Creek Mushroom Farm owners, Sandra and Doug Williams, follow Nature's model. “Shiitake log kits are perfect for vegetarians because these mushrooms are second only to meat in protein,” Sandra explained. “The kit is perfect for mushroom lovers because the highest-quality, most flavorful, meatiest-texture shiitakes grow on real hardwood logs in natural light, rather than in factories. The Single 10” log for $30 is a popular Lost Creek Mushroom Farm kit that has been featured in Martha Stewart’s Whole Living Magazine and in Williams-Sonoma Agrarian Line. Kits start from $18 for the 6” ‘Shroomie, “a cute coffee table conversation piece,” Sandra said. The Original Tray Kit with its own soaking tray has a 14-15” log for $49.95. The Best Buy offers a $10 savings for two Original Tray Kits shipped to the same address for $90. The Ma & Pa Kit with two 10” logs sells for $49.95. Prices include shipping. 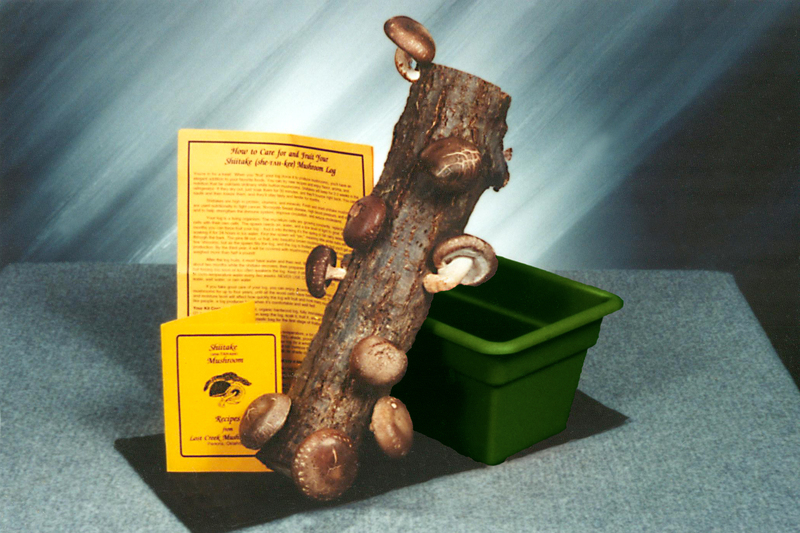 The Ma & Pa and the Best Buy kits with two logs can grow mushrooms every month instead of every other month by alternating the fruiting log. 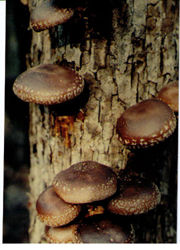 Janet Bratkovich’s Shiitake Sampler Cookbook with 51 kitchen-tested shiitake recipes is $8.95 when shipped with a log. Kits are ready to fruit, come with a hardwood log such as oak or gum, complete instructions, and recipes. Logs over 9 inches long are fully guaranteed. According to Sandra, "A shiitake log makes a nice Christmas present for a whole family." Shipping is included in the price on Lost Creek Mushroom Farm’s website shiitakemushroomlog.com and by phone order at 1-800-792-0053. Lost Creek Mushroom Farm log kits are available on Amazon.com at slightly higher prices when shipping is added. Lost Creek Mushroom Farm donates a portion of sales to Mushrooms in Ghana Project, building a spawn laboratory in Ghana, West Africa, so more small-scale mushroom farmers can grow more mushrooms. Mushrooms in Ghana Project is a program of the Mushrooms for Well Being Foundation, founded by Sandra and Doug to promote mushrooms for food, health, and well being; and small-scale mushroom farming and mushroom consumption worldwide.